Whether corrugated cardboard for POP or digitally printed vinyl, textiles for soft signage applications, for interior design or the fashion industry Zünd provides the perfect, high quality cutting solutions to meet the various requirements of print service providers around the world. With the newest version of Zünd Cut Center ZCC software, Zünd is pushing the productivity limits further than ever before. For example, the new Over Cutter Camera OCC provides fully automated registration that adjusts for stretch, distortion or position in seconds. With a single shot, the OCC captures all register marks that are visible on the substrates in the cutting area. The ZCC software compensates for any stretch and allows the OCC to start processing almost instantly. The browser based Dashboard assists to visualize the performance date of the cutting system throughout production. Production and management supervisors can access Dashboard and all applicable real-time data all the time from any location. In the display and sign industry, digitally printed textiles are becoming increasingly popular. There is a high demand for groundbreaking, high performance solutions and Zünd is responding to this demand e.g. with the G3 3XL-3200. During FESPA 2018 our digital flatbed cutting system will be displayed in combination with the LM 100W Cut and Seal Laser Module. The system can handle rolls of fabric that is up to 3.2metres / 126 inches wide. 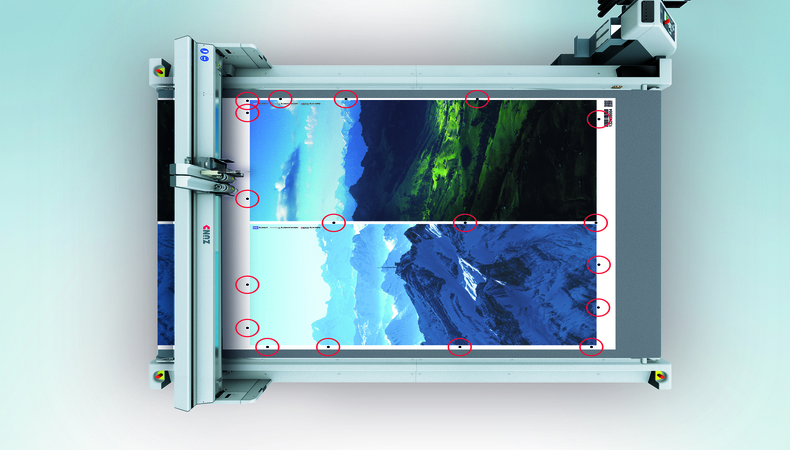 Automated processing of large format rigid substrates including corrugated board or carton, Zünd will be exhibiting an integrated production line featuring the Board Handling System BHS and a D3 cutter. This system showcases automated loading of rigid materials with the outstanding productivity of D3 dual-beam technology. The 2 independently operating beams can carry up to 3 different tools each depending on the job specifics and can deliver up to twice the throughput. The RM-L router spindle delivers up to 3.6 kilowatts of power and unparalleled capabilities for processing dense, hard materials including wood and acrylics. Zünd is providing users a solution for automating the routing workflow with the automatic router bit changer ARC. Zünd’s high performance routing combined with ARC automatic provides supreme productivity for acrylics Dibond, Forex, and MDF applications.